Welcome to April's edition of our "What's New at Durante Rentals" newsletter! With spring in the air, and job-sites and projects in full swing after a brutal winter, we wanted to let our valued customers know what we've been working on to better serve you moving forward. We're Open - Come on Down! We've been working around the clock to stock this location with everything offered at our other three locations including air tools, compressors, chainsaws, generators, boom lifts and more. Did we mention that our Elmsford location will be the main showroom for our newest Takeuchi line? Make sure to stop by and demo one of these beautiful machines. We have many new models already on hand including their most popular skid steers, mini excavators and track loaders. We're located right across the street from the well-known Paul Bunyan statue at the BP gas station. Our address is 122 N. Saw Mill River Rd., Elmsford, NY 10523. Stop by or call us at 914-347-6969. We're both honored and excited to announce that Takeuchi, one of the most respected names in the construction industry, has selected us as their newest New York dealer. Our territory will include all 5 boroughs of NYC, Westchester and Rockland county. We've already started receiving shipments of their most popular and best-selling skid steers, mini excavators and track loaders. Our main showrooms will be located at our Elmsford and Bronx locations while service and parts will be run through our Flushing, Queens location. Inventors of the compact excavator in 1970, Takeuchi is well respected throughout the industry and their machines are well known for their ruggedness, durability, comfort and sleek design. Please visit www.nytakeuchi.com for full details and product specs. stage in Las Vegas March 4-8 with tremendous energy and serious buyers. Durante Rentals was represented by President John Durante, CEO Anthony Durante, and Mt. Vernon Branch Manager and 2013 Durante Employee of the Year, Chris Piesco. Total registration and education tickets sold of 129,364 soared past last edition of the shows as they achieved the second-highest attendance in their history. The shows also set new records for exhibit space and number of exhibitors. We've recently added brand new Solar Tech Silent Messenger Dynamic Message Signs to our rental fleet. These state-of-the-art signs have the capability of being programmed remotely from your desktop, laptop, tablet or even your smartphone. Their new "command center" capability allows you to manage, monitor, and segment your fleet of traffic safety equipment with it's GPS tracking feature. Call us today for more information at 718-697-6969. Durante Rentals President, John Durante, was recently in our country's capital meeting with key decision makers, including the offices of our very own NY Senators Kirsten Gillibrand and Chuck Schumer. John was attending caucuses aimed at changing policies that directly affect us as well as all New York based businesses. One of the key agenda items discussed was the extension of Section 179 of the US tax code, allowing small businesses to immediately deduct costs of certain investments. Basically, it allows a business to accelerate depreciation on many types of equipment that is used for their business. This would allow small businesses to expense up to $500,000 a year if they invest $2,000,000 in new capital assets. Section 179 is a great program as it encourages small businesses to spend money. Once a business spends more than $2,500,000 they are not applicable for any acceleration under Section 179 and therefore it truly is a tax setup to assist small businesses. Another key agenda item was the Health Insurance Tax (HIP) which most would like to see repealed. The new healthcare law includes an $145 billion health insurance tax that will fall hard on small businesses. The HIT, which is levied on health insurance companies, will almost entirely be passed on to consumers in the fully insured marketplace, where nearly all small businesses and the self-employed purchase their coverage. This new tax on small businesses will raise insurance costs for already struggling small businesses and is contrary to the goals of healthcare reform. Our first annual NCAA March Madness Bracket Challenge was a huge success. Thank you to all that participated and submitted their brackets. We hope to make next year's tournament even bigger and better with more participants and more prizes. As you probably already know, there wasn't a single perfect bracket filled out in the entire country. As much as we wanted to give away a free Takeuchi Skid Steer, we'll have to give it another go next year. Once again, congratulations to Anthony Gross for his first place finish. We're sure he'll enjoy his prize of four NY Mets tickets at Citifield with all you can eat Hyundai Club access. Lets go Mets! New York is about to embark on a historic building boom - and that has touched off a furious new round in a long-running battle about how to protect the health and safety of the workers who create the city's glittering skyline. Construction of office space, institutional development, sports/entertainment venues and hotels fell to 6.9 percent in 2013 to $8.4 billion from the prior year, making the third consecutive year-over-year non-residential spending decline, according to a new New York Building Congress analysis. Gov. Andrew M. Cuomo announced that all 112 NY Works accelerated bridge projects have been completed and open to motorists. With this milestone, a majority of NY Works-funded transportation infrastructure projects are completed. Construction equipment is useful for digging through soil, erecting new buildings, and.....engaging in the largest Jenga competition known to man. WASHINGTON - U.S. home construction rose moderately in March as builders resumed work at the end of a frigid winter. But, applications for building permits slid, clouding the outlook for future construction. Builders started work on 946,000 homes in March, up 2.8 percent from 920,000 in February, the Commerce Dept. said. Did Construction Workers Just Unearth L.A.'s Original Aqueduct? It began as little more than a modest trench in the ground, but its name - Zanja Madre,or Mother Ditch - speaks to the importance of this proto-aqueduct to early Los Angeles. Diverting water from the free-flowing Los Angeles river, the Zanja Madre did indeed rear tiny Los Angeles, founded in 1781 as an agricultural colony on the outskirts of the Spanish empire. 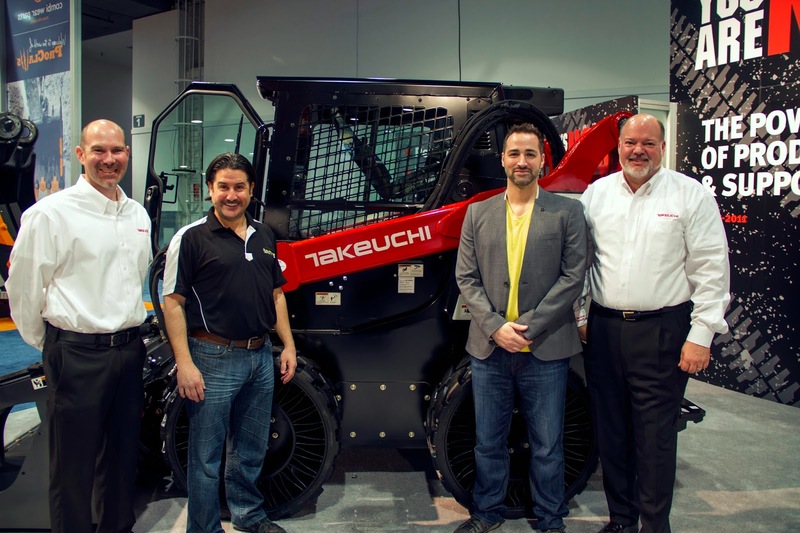 Takeuchi-US has announced Durante Rentals as their newest dealer in New York. Durante Rentals will carry the full line of Takeuchi compact earthmoving equipment, including compact track loaders, compact excavators, compact wheel loaders, and skid steer loaders. With four locations throughout the NYC and Westchester area, Durante Rentals provides construction equipment rentals and sales from locations in Elmsford, Bronx, Mt. Vernon and Queens. Durante Rentals, an INC 5000 company (#1,879 in 2013), is considered one of the fastest growing equipment rental companies in the industry. “We pride ourselves on our families’ long history in the New York construction industry,” said John Durante, President of Durante Rentals. “The Durante name has always been synonymous with first-class customer service and a level of quality that far surpasses our competition. We partnered with Takeuchi because we know they share these same characteristics. They are a quality company with a quality line of equipment,” says Durante.